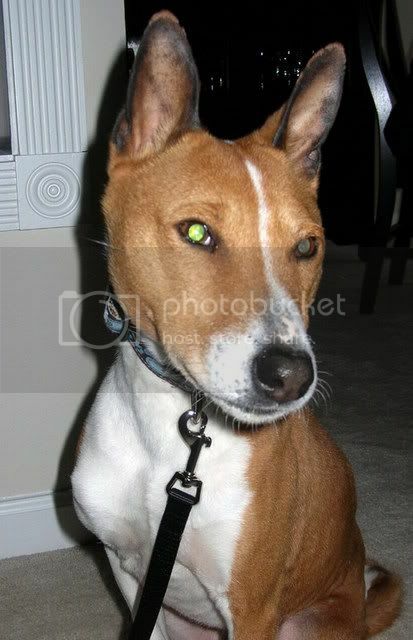 So my husband and I wanted to add another Basenji to our family. We have a 6 yr old little girl who is the love of our lives. We put in for some BRATs, but we had no luck because we were so far away. I finally found a little boy in a shelter in PA. I called and spoke with the shelter. They agreed to "hold" him for me until I could bring my hubby and little girl with me to go meet the new little man. His name was Ben in the shelter, but his new name is Miles. Miles was picked up as a stray. Pretty much nothing about his previous life experiences is known. We don't even know how old he is. I saw his mugshot on Petfinder and thought he looked like a little guy who might be perfect for us. The only problem is that he was 100 miles away! 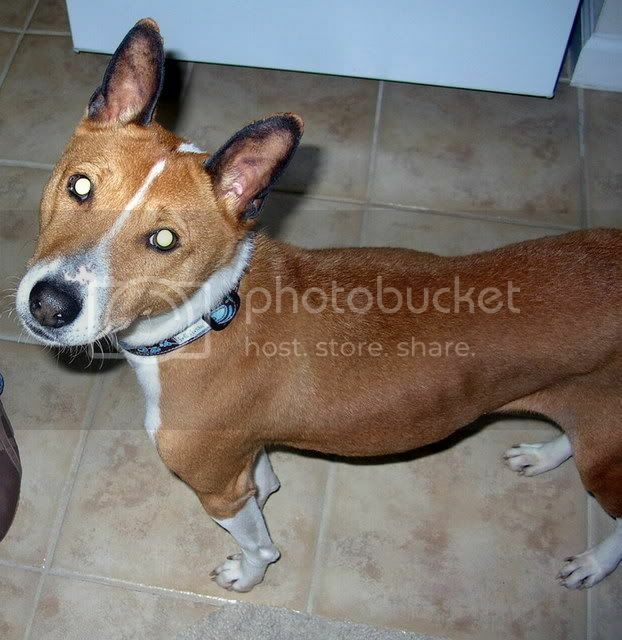 Thanks to THIS message board, I found Basenji_Boy who could possibly be in the same area and message him asking if he would be willing to check out this little fella in the shelter for me. Without hesitation, the very next day I had photos, videos, and an evaluation on their visit with him!! Major kudos for him and his family!!! We still can't thank you enough!! 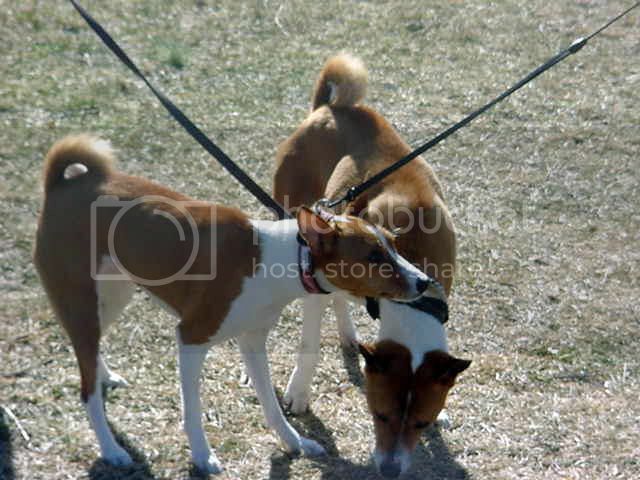 This past Saturday we drove to shelter and met up with Basenji_Boy and family. They brought two of their 8 dogs with them to meet our little girl. What cuties!! Then we went over to the shelter to meet Miles. The shelter was VERY busy and the whole adoption process took over 2 hours. But we were able to spend some time with him and make sure the two dogs got along with each other. He sat down and took the treats I offered him very gently. He even gave me his paw!! What a sweetheart. But despite his current personable appearance, we still did not know his previous experiences and were still a little nervous to adopt such an unknown. What we DO know now is that he is a true gentleman. He is remarkably well behaved. He can sit, stay, shake, and lie down on command. Hubby even told him to go lie down in his bed and he went straight to his new pillow and plopped down. We both stared at each other in disbelief! He can be touched all over and lifted without any issues at all. He even stacks! He has yet to beg for food at the table despite our little girl's best efforts. He let me clean his ears and wash his face with a washcloth. His nails don't need trimming but he let me inspect them without any issues. His tummy is still very upset. We are giving him some anti-diahhrea meds to help with his transition. You can hear his little stomach gurgle all the time. He has not had any accidents in the house, although he did try to mark my jacket earlier. He stopped immediately when I said NO. He slept through the night with the exception of three attempts to get into bed with us. And today he has had 3 loose stools and lots of peeing outside. Miles & Lexi are getting a long MUCH better today. They had one little spat yesterday that left us wondering a little bit. Lexi's a little sassy and a sometimes possessive and might have bitten off a little more than she could chew with him- as he is significantly bigger. But her gurgles are much more reserved now and they are even lying closer to one another. The only issue we're concerned with at this point is crating him. Holy geez he is LOUD! 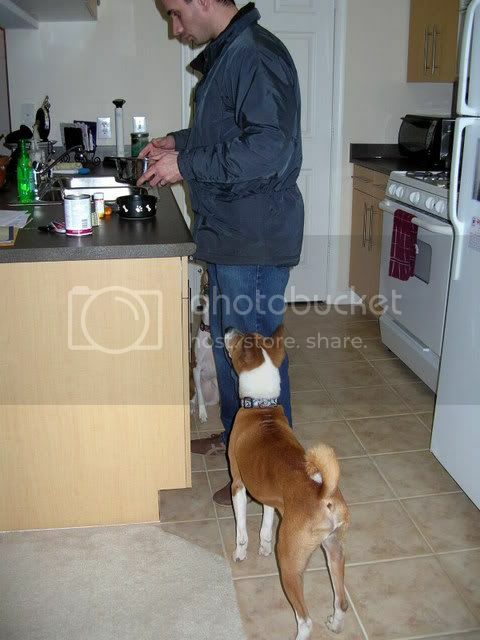 Talk about a hound dog…. He sounds like the fire alarm!! :eek: We live in an apartment so if he carries on, it will not be pretty. We've corrected him while he's in there but do not let him out. He was improved today from last night so that is encouraging. We will keep trying shorter periods in the crate today but the real test will come tomorrow when we have to be at work. Anyways, thought I'd share our story with you all. Thanks to this message board and Basenji_Boy we have a new little man in our lives! Making sure they mesh at the shelter. Mommy & Daddy adopting me!! Miles's first bath! What a good boy! Miles and Lexi supervising Daddy making dinner. Skin & Bones!! We're going to fatten this little guy up! His delicate little ears need TLC and good nutrition! The kids warming up to each other. Miles is a Daddy's boy! What a neat story, BDawg! 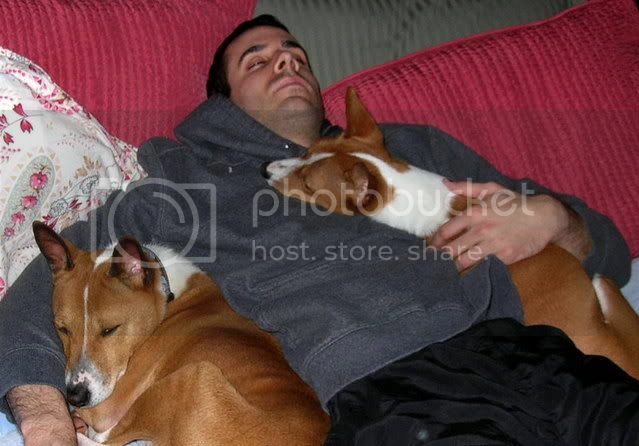 I like the group nap pic best. Huge congrats on the rescue!! And what a cute boy he is. Whats wrong with his ears? You said they're going to need lots of TLS, and I notice they are rimmed black? This is such a touching story!!! We're so happy for your family that you adopted Miles!! He's a sweet looking boy and it seems as though he's settling in to your pack quite nicely! 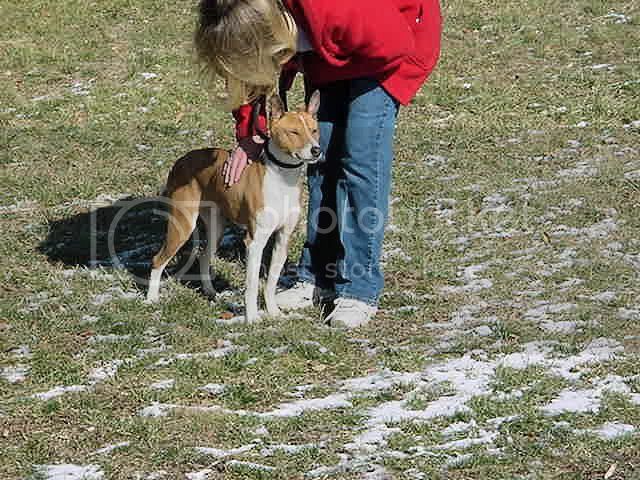 Big hugs and kudos to your family and Basenji Boy's family for making this happen! Dear little Miles is now living the life he deserves thanks to all of you!! 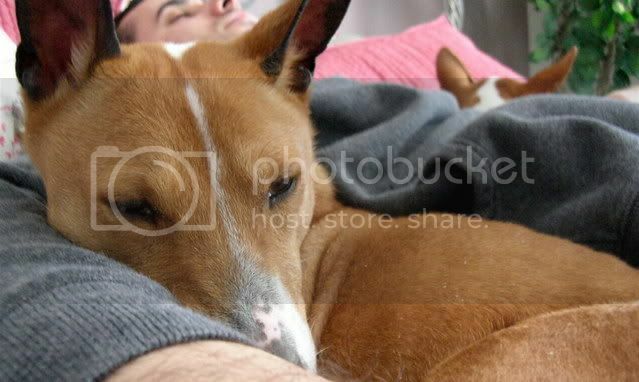 From what I understand, when Basenji's are left to extreme colds, their ears are the first things to deteriorate. His ears are very crunchy and black- it's like they are chapped from being outside. We've been recommended to use vitamin E oil and vasoline to keep them moisturized. His coat is VERY dry and wintery! As he gains weight and eats better, I am hoping his coat and ears will improve!! oh my goodness! thank you for saving him! poor baby miles and lexi are a lovely pair. bboy is such a nice guy! best of luck!
! (images/smilies/rolleyes.png "Roll Eyes (Sarcastic)") why, yes, i have a very full life-full of little catastrophes! I think he'll fit right in… I just have to figure out a better way to put the bowls down faster and further apart... They keep having spats over the dishes! Congratulations! 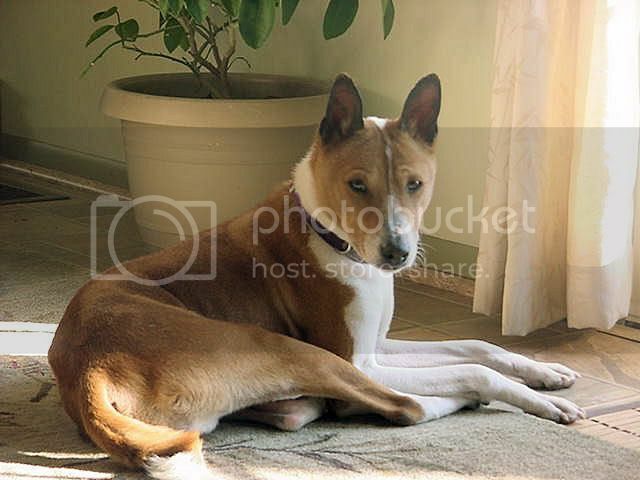 That is so great that Basenji Boy could help you guys. What an awesome story. Wonderful story to a new beginning. Congrats with Miles. Lexi and Miles look so like bro' & sis'. BBoy is a fantastic person in assisting you and helping to bring Miles home. I love his name - fits with his story - if we could only know exactly what he went thru. He's a survivor alright. From here on, he'll sleep so much better. Thank you for saving him. Yay for you! I am so glad things are working out! A couple words of advice. Feed them seperately! Don't even give them the chance to fight over food. He is VERY undernourished, and has every reason to fight over food. Lexi is getting used to having a 'brother'..don't set her up to have to fight over her 'stuff'. Also, please don't 'correct' him in any way for screaming in his crate. For one thing, if he is frightened of his new situation, you are going to make it worse. If he just wants your attention, correcting him (or paying any attention to him) while screaming is going to reinforce it, instead of making it go away. That is wonderful of you! Thank you for sharing the pictures, they tell the story so nicely and I'm sure you'll have a transition period but it seems to have gone well so far. Keep us posted…I know you will! Ah hahahahah… Basenji_Boy, your comment left me grinning ear to ear! How cute!! You guys were so awesome and so very generous with everything! I really can't thank you enough! I really think Miles was meant to be for us. He is very special. Without your evaluation, I'm not sure I would have had the confidence to follow through with adopting such a "wildcard" (no previous experiences known). It was so great to get so many pointers from you all! His little tummy is still upset, but he's eating well now. I still hope his ears improve, but the two of them are actually curled up and TOUCHING right now!! WOO HOOO! What a little gem!! YEAH!! I am SO THRILLED!!!! Oh! I just had to reread it… that little Priceless commercial was so cute!! Makes me smile!! What a great experience!! 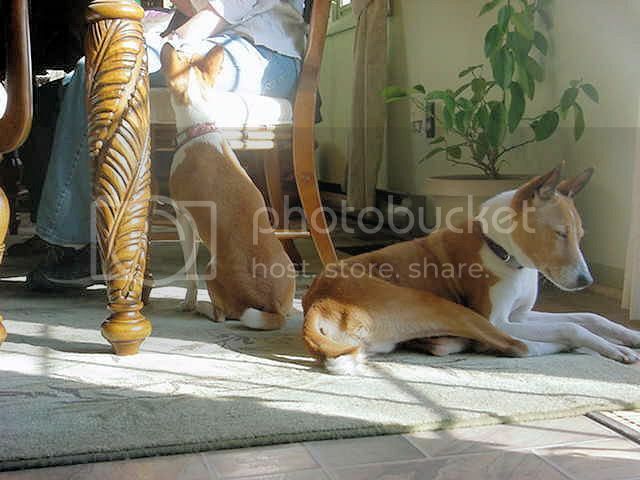 PS- Thanks for the discounted winter rates to Basenji Park! hahahahh! What a great story!! So glad B-BOY and his clan were able to assist you with such a big decision. I can understand your apprehension. I think it's great that we can call on each other for assistance & guidance. I would completely trust B-BOY's opinion on this too! 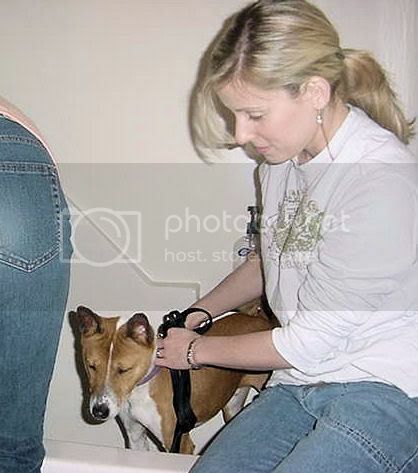 He's got great B experience running Basenji Park and all. Congrats to you & Lexi on your new furbaby. I'm sure Miles will settle in with some time. They say it takes about 3 months for them to get acquainted with their new environment. Perhaps in time this is all he will need to adjust to his crate. GOOD LUCK & Many blessings to you for doing such a good deed! OK, maybe I'm just hormonal, but I got teary BB & BDawg…the photos and BB's "priceless" commercial is just too sweet!